It was super interesting to join Ecotopia Biketour (EBt) again, after 5 years not taking part and almost have lost contact. I would like to share here some of my thoughts that were eminent during this years tour, my fifth EBt. The first time being in 2008. Joining biketour for the fifth time is not the same as the first experience. The past experiences make that you have memories coming up from other years influencing the feelings, ideas and proposals that you will bring to the group. Luckily some other former EBt friends popped up as well! The year 2018 is a jubilee year in my life: 10 years ago I started traveling and joined my first EBt. 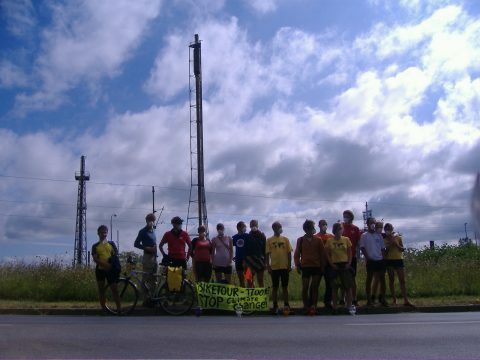 I was coordinating that tour, that went through Bulgaria and Turkey to the Ecotopia gathering, an action camp to protest against a nuclear power plant planning to be constructed on the Black Sea coast. Just after I finished my studies I left the country that I was born in and chose to go off traveling with my bike. I did never choose to go back to stay in my birthplace again. I found another path while cycling with EBt, which I joined in the following 4 years. What was different back then? What stayed the same? What evolved? Biketour got more autonomous, that is clear. There is no central coordination/coordinators anymore, which in the past would get some money via EVS*, to be able to live and survive somewhere, in an mostly unknown country, while planning the tour there with locals. A clear decision and maybe a good one to let this positions go. Creating a more horizontal structure and the need to delegate tasks and parts of the route during the preparation. This year I went to the spring meeting and helped planning a part. I felt joy to work with the others. So much different to not be alone in planning! There is moments you can pull your hands off if you feel you need to make too many decisions without support. Also during the tour it is a relief to know there is more people on board that know how EBt is planned and that will support the project, know the basic principles and keep an eye on social dynamics, based on former experiences in Bt. 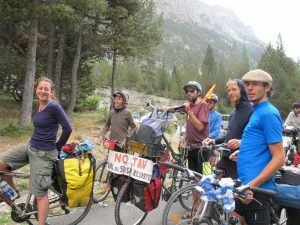 It seems to be less exhausting now for “organizers” and if still, there is a possibility to take a break – “Biketour holiday”. The people were amazing, like every Bt I experienced. Every tour you make new friends. Traveling together and managing the daily life of the group collectively, creates moments you go more deep, creating different kind of relationships. Different than the fragmented moments in work/school or bar situations. You share it all, 24h a day. Getting up, trying to find nutritious food; comfortable places to stay; and emotional support when needed. Although we did have much less shared moments in this Bt than in other years. There was no agreed daily rhythm or structure, no morning call to wake up together. No shared daily-info moment or common breakfast or lunch. This year everyone could have their own rhythm: get up when you want, leave when you want. So many times we would only meet at the end of the day in the camp place. Some people leaving the former camp only at the end of the afternoon and arriving in the dark. This felt weird to me, I missed collective moments. And even the circles! In the almost 2 weeks I joined this tour, we just had 2 (short) circles. I remember times with daily circles and endless discussions, but also the decision to have daily practical info moments and once in 3 days and extended circle. I missed this moments to share and decide together. A new thing was the idea of forming buddy groups, smaller units of people that would share how they feel in the big group and take a bit more care of each other, but it seemed to be hard to form them. Somehow I was lucky to find my buddies, but we also just managed to meet once. On the other hand I never was in such a huge Bt before! Enormous. Just before I arrived there were 50 people… It made me scared.. I was happy to find out that there were (just) about 40 left when I arrived. Probably such a big number makes it harder to create group moments, which so many diverse needs and rhythms: How to organize something collective without creating pressure on someone? It was hard to enter the group, feel comfortable and get to know the names of people. I think most people would need an intense week of Bt before starting to understand how “it” functions. I remembered that “dumpstering” happened a lot in the UK in 2010, but the years before we did not do it at all. In the Balkans and Bulgaria and Turkey we wanted to buy local and support the small shops and people. At the markets we could see other people taking food from the bins and we didn’t want to create “competition” with people that might need to skip. I saw Bt still making a deep impact on peoples lives. Bringing them in conflict with personal habits and trespassing peoples comfort-zones. Getting emotional, angry, frustrated and being honest about it. And after finding ways again to come together, to make music, sit around the fire and have fun while cycling. 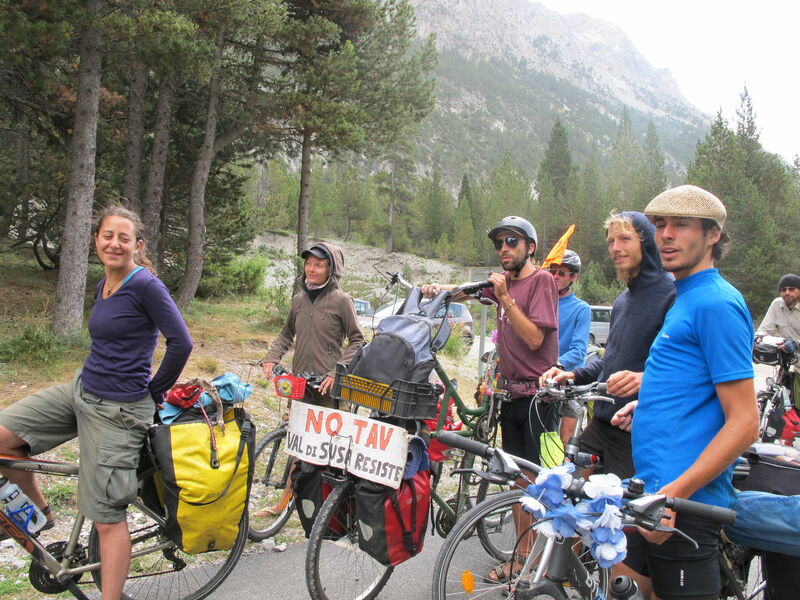 Ecotopia Biketour has a long life and many years to come. It will always be different, participants will change, but it stays an unique experience experiment to live in a self-managed nomad community on bikes.